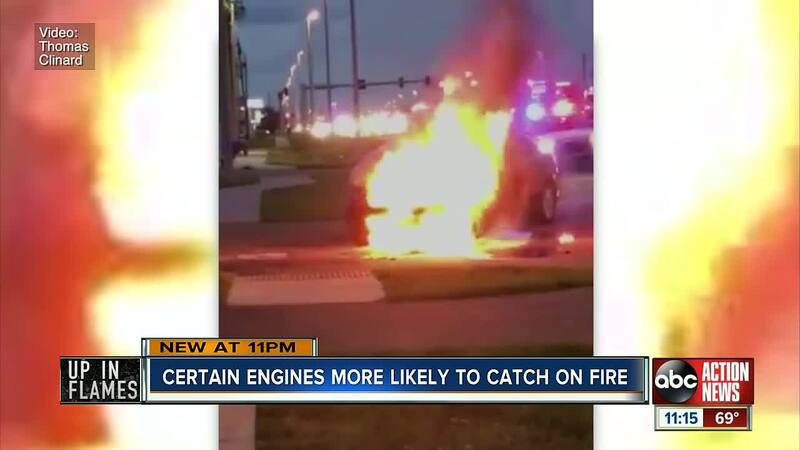 An alarming new study found certain engines in Kia and Hyundai vehicles are more likely to catch fire than any other vehicles on the road, an I-Team review found. 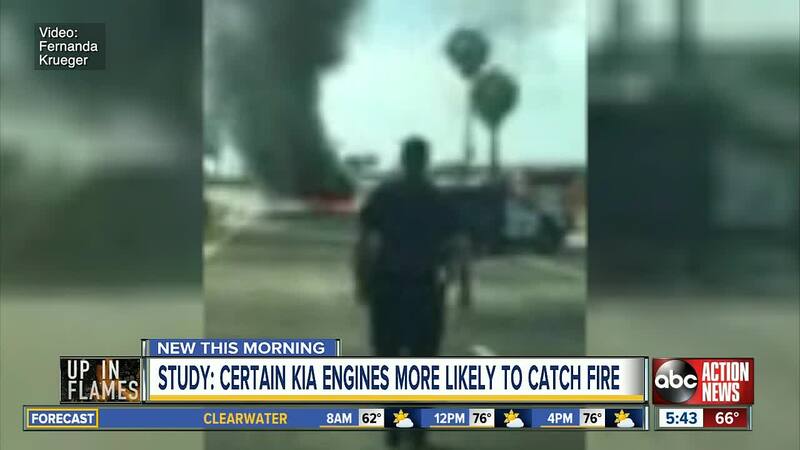 TAMPA, Fla. — An alarming new study found certain engines in Kia and Hyundai vehicles are more likely to catch fire than any other vehicles on the road, an I-Team review found. Matt Moore, who oversaw the engine study at the Highway Loss Data Institute, reported Kia and Hyundai vehicles with two-liter, turbocharged engines were more than three times more likely to catch fire than engines in any other similar-sized vehicle on U.S. roads. The I-Team discovered those engines are found in 2011 to 2015 Kia Optima, 2011 to 2014 Hyundai Sonatas and 2013 to 2014 Hyundai Santa Fe Sports. The automakers have recalled most of those vehicles since January – after the I-Team’s months long investigation into hundreds of unexplained Kia and Hyundai fires. Hyundai points out that it started recalling vehicles back in 2015 and again in 2017. The I-Team also uncovered the automakers have yet to recall all vehicles running on another potentially hazardous engine – a 2.4-liter model that the institute found is nearly two times more likely to catch fire. The automaker does say however that they have recalled many models that contained the 2.4 liter engine. That was the same engine in Kirstin Wilson’s 2016 Kia Sportage when it burst into flames as she drove down a Georgia highway last summer. “It literally blew up in front of us with all of our stuff in it,” said Wilson. But Wilson’s SUV is not among the hundreds of thousands of models Kia recently recalled for fire hazards. A Kia spokesman said the automaker negotiated a resolution with Wilson because she only owned the vehicle for one month before the incident. The I-Team also found Fernanda Krueger’s 2016 Kia Sorento is also not on the recall list – even though her SUV with a 2.4-liter engine burned up last April in San Diego. “I was driving with my car on fire,” said Krueger. Kia and Hyundai have recalled nearly 700,000 vehicles since January, but the Center for Auto Safety told the I-Team that’s still not enough. Last year, Jason Levine of the the Center for Auto Safety petitioned federal regulators to force the automakers to recall 2.9 million vehicles. “There are probably several million vehicles between the two manufactures Kia and Hyundai that remain not at a recall status that remain potentially a fire risk,” said Levine. The I-Team also uncovered insurance claim records showing more Kia and Hyundai vehicles are catching fire than have been reported to government regulators. Those records show more than 2,700 fires in just five models alone – 2011 to 15 Kia Optima, 2011 to 14 Hyundai Sonata, 2011 to 15 Kia Sorento, 2011 to 12 Hyundai Santa Fe and 2013 to 14 Hyundai Santa Fe Sport. The I-Team asked Kia and Hyundai whether the companies plan to expand the recalls. The automakers wouldn’t answer that question directly but said safety is a top priority. Kia Motors America (KMA) recognizes that customer safety is paramount and is committed to addressing every thermal incident. KMA continuously evaluates all Kia models as part of its standard vehicle monitoring activities. If a safety defect is detected through the course of vehicle monitoring, Kia promptly reports a safety related defect to the National Highway Traffic Safety Administration (NHTSA) within the five days mandated by 49 CFR 573. Depending upon the underlying cause of a recall, not all vehicles of any one model and model year may be included due to varying configurations and equipment. The SC147 recall pertains only to those vehicles equipped with GDI engines within the applicable models. Claims involving damage to a Kia vehicle, including fires, are reviewed on a case-by-case basis and if a fire is determined to be the result of a Kia manufacturing issue, KMA will work with the customer to reach a satisfactory resolution to the matter. If a recall is unable to be remedied immediately, KMA will provide alternate transportation at no cost to the customer until their vehicle is repaired or another satisfactory resolution is determined. KMA always encourages customers to remedy any open recalls as quickly as possible by taking their vehicle to the nearest Kia dealership. Additional information about open recalls may be found by visiting www.kia.com/us/en/content/owners/safety-recall or through www.safercar.gov. Hyundai actively monitors a myriad of data sources, including our own and from third parties such as NHTSA and the insurance industry, that provide insight into the engine problems currently associated with some of our vehicles. It is our opinion that no single data set on its own can provide a comprehensive assessment. For example, in the HLDI December 2018 report that you cite specific to Hyundai and Kia noncrash fires, the control group utilized excludes “vehicles with a documented non-crash fire-related recall.” Yet all of the Hyundai vehicles included in the report – with the one exception being the 2011-2012 Santa Fe – are under recall to address a manufacturing issue that could lead to a noncrash engine failure and in few circumstances an engine fire. The methodology is therefore flawed and does not produce an accurate comparison. Among the 5.3 million Hyundai vehicles analyzed in that HLDI report over an eight-year period, a noncrash fire insurance claim has been made for 0.027 percent of those vehicles. In more recent model years, HLDI’s noncrash fire loss report from September 2018 (attached) shows that the relative claim frequency for noncrash fires in all 2015-2017 Hyundai vehicles is at the industry average. Between the two-year period from November 1, 2016 to November 1, 2018, Hyundai was notified and completed fire-related inspections on 428 vehicles from among our currently estimated 8.7 million vehicles on the road today. Of note, these inspections included all types of vehicle fires, not solely engine fires. So over the past two years, Hyundai was notified that 0.0049 percent of all Hyundai vehicles on the road experienced a noncrash fire. Meaning, for every 1 million Hyundai vehicles on the road, 49 experienced a noncrash fire over the past two years. Additionally, according to the National Fire Protection Association there are approximately 160,000 vehicle fires per year and collision-related fires represent only 4 percent of those. Hyundai vehicles account for a very small portion of these overall fires. Nothing is more important than the safety and security of Hyundai customers. We have taken numerous proactive actions to address engine problems with our vehicles, including several recalls, a software update and an extended warranty. Hyundai has also launched and is promoting an online resource for the recalls and product improvement campaign, www.HyundaiEngineInfo.com and has significantly enhanced its customer service response to take care of impacted customers.